Goodfellow presents a series of podcasts featuring topical and relevent information for health professionals. Click on an episode title listed below and then click on the play button. 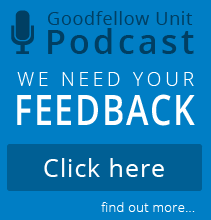 You do not need to be logged in to listen to Goodfellow podcast episodes. You can also listen to the Goodfellow Clinics podcast via itunes. Displaying 81 - 90 of 109 podcast episodes. In addition to listening here on our website to podcast episodes, you can also subscribe. This will keep you up to date on our new episodes. Subscribing via your favourite mobile app will let you listen on the move, anywhere at any time. The Goodfellow Unit podcast is funded in part by the Royal New Zealand College of General Practitioners.